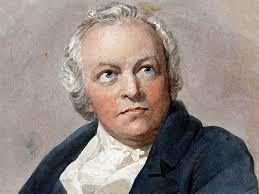 Although not highly regarded either as a painter or poet by his contemporaries William Blake has the distinction of finding his place in the top ten of both English writers and English painters. Blake began training as an illustrator and engraver and worked at that as his day job. And in the meantime he wrote his poems. The most important thing about Blake as a poet is his rejection of the highly sophisticated verse structures of the 18th century: he looked back to the more immediate, accessible poetry of Shakespeare, Jonson and the Jacobeans. He used monosyllabic words and packed more meaning and feeling into them that any of the poets of his time did, writing their expansive, sophisticated poems full of figures of speech. For example, two of Blake’s most famous collections: Songs of Innocence and Songs of Experience contain some of the finest and most profound of English poems, all done in the most simple language. Songs of Innocence reveals a world of childhood innocence, written in nursery rhyme rhythms but containing shadows of the world of experience to come – so The Lamb, often taught to children to recite as a nursery rhyme has its counterpart in the Songs of Experience in The Tyger (Tyger tiger burning bright/In the forests of the night…) The Tyger is also expressed as a nursery rhyme and learnt by children but it is at the opposite end of experience. ‘O Rose, thou art sick! The idea of love destroying someone’s life is at the centre of the poem. The love is forced to be dark and secret because social attitudes, conditioned by the Church, are opposed to sexual love. The language is highly sexual – crimson joy, bed of crimson joy, worm etc – and what should be something joyful becomes a disease instead. William Blake’s most famous poem Jerusalem (“And did those feet in ancient times”), is still regularly sung as an anthem at gatherings of numerous societies, and at the end of the world’s top music festival, the Proms in London, by a well known singer.